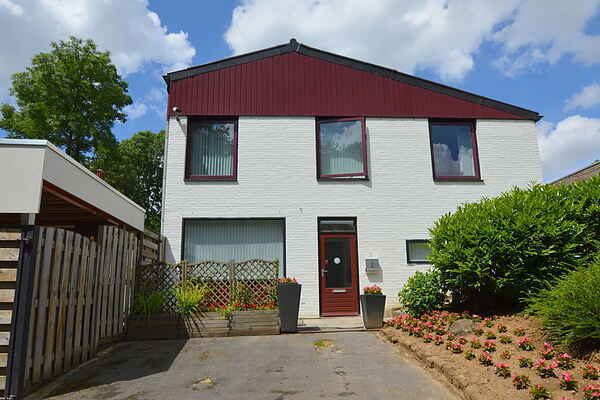 Central in the heart of South Limburg at less than 4 km from Valkenburg and at 15 km from Maastricht lies this beautiful holiday home. This luxury vacation home has it all: large flat screen TVs in the two spacious bedrooms, a children's room with two bunk beds with a variety of games, a spacious bathroom with a sauna, a very well equipped kitchen and a spacious terrace with lounge set gas fireplace and BBQ set. The natural environment is perfect for trips by bicycle or motorbike. If you bring your own (racing) bike, motorcycle or mountianbike, you can store it safely in the fenced yard. Do you not bring your own gear then there is the possibility to rent a bike or scooter. The owner of this house is also the owner of the adjacent restaurant and bowling center with great indoor playground where children may play free of charce during business hours. During your stay you also get offerd 1 free round of bowling. South Limburg has a lot to offer to its guests. The caves in Valkenburg, the three countries point in Vaals, the historic town of Maastricht, Gaia Zoo it are just some of the many possibilities for a day out.